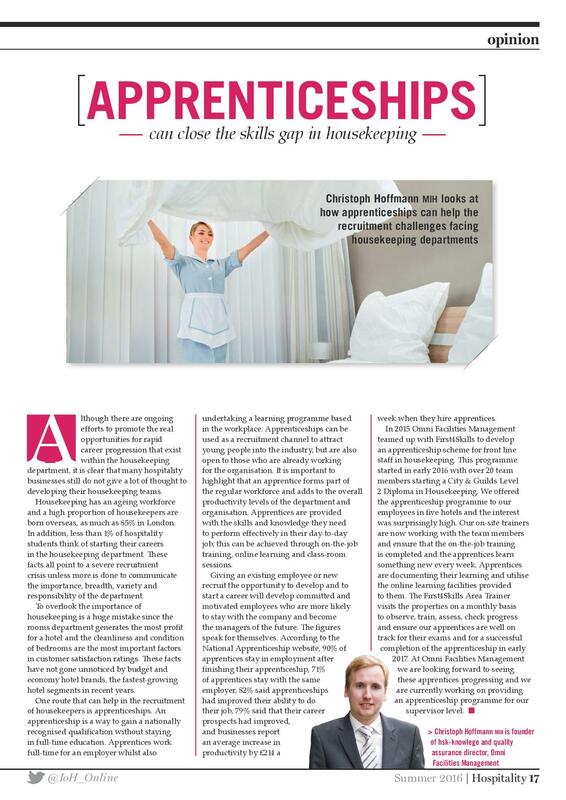 Christoph Hoffmann MIH looks at how apprenticeships can help the recruitment challenges facing housekeeping departments. Although there are ongoing efforts to promote the real opportunities for rapid career progression that exist within the housekeeping department, it is clear that many hospitality businesses still do not give a lot of thought to developing their housekeeping teams. Housekeeping has an ageing workforce and a high proportion of housekeepers are born overseas, as much as 85% in London. In addition, less than 1% of hospitality students think of starting their careers in the housekeeping department. These facts all point to a severe recruitment crisis unless more is done to communicate the importance, breadth, variety and responsibility of the department. To overlook the importance of housekeeping is a huge mistake since the rooms department generates the most profit for a hotel and the cleanliness and condition of bedrooms are the most important factors in customer satisfaction ratings. These facts have not gone unnoticed by budget and economy hotel brands, the fastest-growing hotel segments in recent years. One route that can help in the recruitment of housekeepers is apprenticeships. An apprenticeship is a way to gain a nationally recognised qualification without staying in full-time education. Apprentices work full-time for an employer whilst also undertaking a learning programme based in the workplace. Apprenticeships can be used as a recruitment channel to attract young people into the industry, but are also open to those who are already working for the organisation. It is important to highlight that an apprentice forms part of the regular workforce and adds to the overall productivity levels of the department and organisation. Apprentices are provided with the skills and knowledge they need to perform effectively in their day-to-day job; this can be achieved through on-the-job training, online learning and class-room sessions. Giving an existing employee or new recruit the opportunity to develop and to start a career will develop committed and motivated employees who are more likely to stay with the company and become the managers of the future. The figures speak for themselves. According to the National Apprenticeship website, 90% of apprentices stay in employment after finishing their apprenticeship, 71% of apprentices stay with the same employer, 82% said apprenticeships had improved their ability to do their job, 79% said that their career prospects had improved, and businesses report an average increase in productivity by £214 a week when they hire apprentices. In 2015 Omni Facilities Management teamed up with First4Skills to develop an apprenticeship scheme for front line staff in housekeeping. This programme started in early 2016 with over 20 team members starting a City & Guilds Level 2 Diploma in Housekeeping. We offered the apprenticeship programme to our employees in five hotels and the interest was surprisingly high. Our on-site trainers are now working with the team members and ensure that the on-the-job training is completed and the apprentices learn something new every week. Apprentices are documenting their learning and utilise the online learning facilities provided to them. The First4Skills Area Trainer visits the properties on a monthly basis to observe, train, assess, check progress and ensure our apprentices are well on track for their exams and for a successful completion of the apprenticeship in early 2017. At Omni Facilities Management we are looking forward to seeing these apprentices progressing and we are currently working on providing an apprenticeship programme for our supervisor level.